Last week we detailed the nexus between two Washington Post articles on the NSA and argued that the Foreign Intelligence Surveillance Court that is nominally supposed to protect Americans’ privacy (and has in the eyes of many observes and constitutionalists failed miserably) only knows what the Obama administration, or any future government that is even worse, tells it. The practical and obvious result of this problem is that unconstitutional activity goes on as long as the government chooses to keep it a secret. The same can be said for Congress, especially the leaders of the House and Senate Intelligence Committees. But questions about Rogers’ own stewardship of classified information regarding the NSA has now surfaced and Rogers is under growing pressure to explain whether he withheld surveillance information from members of Congress before a key vote to renew the Patriot Act. Allegedly, the Justice Department and intelligence community prepared a document to inform non-intelligence committee members about bulk collection of Americans' phone records ahead of the vote to renew the Patriot Act back in 2011. Michigan Republican Justin Amash says that the committee kept it from the vast majority of House members who are not on the Intelligence Committee. Amash told the Guardian on Monday that he had confirmed with the House intelligence committee that the committee did not make non-committee members aware of the classified overview from 2011 of the bulk phone records collection program – even though the document was expressly designed to be shared with legislators who did not serve on the panel. It appears that a corresponding document for the Senate in 2011 was made available to all senators. "Nobody I've spoken to in my legislative class remembers seeing any such document," Amash said. 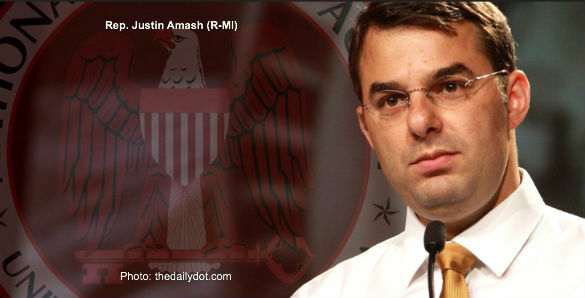 Amash speculated that the House intelligence committee withheld the document in order to ensure the Patriot Act would win congressional reauthorization, as it ultimately did. As the Guardian’s Spencer Ackerman observed, the accusations broaden the focus of the surveillance controversy from the National Security Agency to one of the congressional committees charged with exercising oversight of it – and the panel's closeness to the NSA it is supposed to oversee. And therein lies the problem – the Chief Judge of the FISC court has already said the court lacks the tools to independently verify how often the government’s surveillance breaks the court’s rules that aim to protect Americans’ privacy. Without taking drastic steps, it also cannot check the veracity of the government’s assertions that the violations its staff members report are unintentional mistakes. In other words, lie by omission. Now it comes out that the congressional committees charged with oversight of the NSA are also withholding documents and information from other members of Congress who are charged with making informed decisions about whether or not the government should be allowed to conduct certain activities – like spy on innocent Americans. The problem for defenders of the surveillance state is that when Americans are told what’s going on they don’t like it. Far from being persuaded by the attacks on him, Congressman Amash’s constituents broke into applause when he told a town hall meeting in Marshall, Michigan that he voted against the Patriot Act when it was up for re-authorization. As we said last week, these revelations taken together should engender much more stringent oversight of the NSA by Congress. The problem is that too many members of Congress, who should have the constitutional rights and liberty of their fellow Americans upper most in their minds, have been suckered into a “technology can save us” mindset and become complicit in the advancement of the surveillance state. It’s time to ask tough questions about the National Security Agency’s surveillance activities — even for Republicans who have given the NSA the benefit of every doubt up until now.